When Earth formed 4600 million years ago, most of its original atmosphere contained highly reducing gases, dominantly hydrogen and helium together with carbon monoxide, methane, nitrogen, ammonia and hydrogen sulphide. This composition was common to all the atmospheres of the terrestrial planets in our solar system. It was the continuing volcanic activity on Earth that changed this primary atmosphere into a secondary atmosphere through the release of carbon dioxide and water vapor as well as methane, sulphur dioxide and nitrogen by volcanic degassing. The increasing level of these gases produced a powerful greenhouse effect that retained enough of the Sun’s heat to keep the Earth’s surface temperatures above freezing, although the Sun was only about 70% as bright as it is today. Although oxygen existed in compounds such as H2O and CO2, the earliest atmosphere contained no free oxygen at this time. 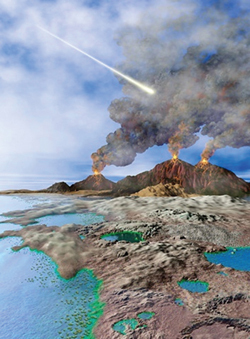 Water vapor was not only added to the atmosphere by volcanic activity, but also through frequent bombardment by comets which brought more water to Earth. As the Earth’s surface cooled and solidified, this water vapor condensed and collected on the surface forming the first oceans.